So, while I was at CATS, I spent some time working on Christine’s Round Robin. She asked us to stitch a set of seasonal hearts. 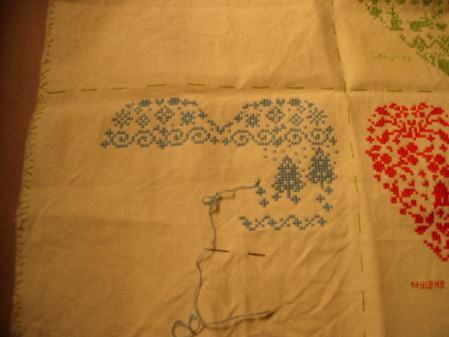 I chose to stitch the winter heart in a nice pale blue. It reminds me of how cold winter can be and the blue glare you get off of the snow some times. Here is my progress so far. I should have it done this coming weeknd. While I was away, I also got a special package in the mail from Sylvie. She stitched us a lovely black cat wallhanging. It is all done over one and is absolutely stunning. She also made me a cute stuffed kitty and sent a ball and catnip mouse for the cats:) Thank you so much Sylvie. I love the gift:)!!! I love your exchange from Sylvie, it’s so cute. Christine’s RR is coming along nicely too! 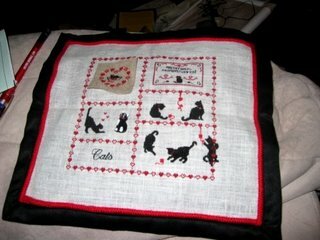 Wow, fabulous exchange piece Sylvie sent! You must be very happy. 🙂 Your round robin work looked even lovelier in person. You are doing a great job! Christine will be so pleased.